I discovered expat Aussie Dominic Smith as an author of interest when his novel Bright and Distant Shores was shortlisted for the 2011 Victorian Premier’s Literary Awards (see my review). I liked his style. He’s a storyteller first and foremost, and he crafts beautiful prose that carries his tale really well. I decided to check out his debut novel. 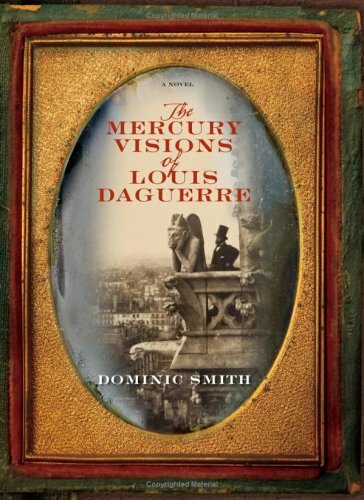 Like Bright and Distant Shores, The Mercury Visions of Louis Daguerre is set in the past, which suits Smith’s descriptive style of writing. It’s a fictionalised life of Louis Daguerre (1797 -1851), the Frenchman who invented the daguerreotype, an early form of photography. (Such is his importance, Daguerre’s name is one of 72 inscribed on the Eiffel Tower along with other French scientists and engineers). The novel traces his fascinating quest to find the means of transfixing a transient image for eternity, but also a second quest consequent on the first. The opening chapters reveal that Daguerre is suffering from mercury poisoning and is intent upon a quest to photograph 10 special items before he dies. (The real Daguerre actually died of a heart attack). It’s an accomplished debut novel. There is a (perhaps somewhat improbable) love story but the life sketched (loosely based on real life) is convincing. Daguerre lived through the turmoil of the French revolutionary period and the Industrial Revolution and Smith paints a persuasive portrait of Parisian life at that time. He shows the raffish lifestyle of the theatrical milieu; the crowds flocking to the dioramas Daguerre exhibited; backstreets and boudoirs; even a morgue. Charles Baudelaire the poet makes an appearance too: he and Daguerre share the same philosophy of wanting to capture the fleeting experiences of ‘modern’ life. He worked all day and night, refining the process. He decanted mercury from the keg into metal trays. These became his mercury baths, heated on the wood-burning stove and taken into the confines of the darkroom. If he angled the exposed image above the hot mercury, passing it back and forth, he obtained the best result. He watched the mercury vapours draw line and edge onto his plates. The air thickened around him, a metallic brume that watered his eyes. It had an elusive smell, something acrid but fleeting, like iron railings in the rain. It caught in the back of his throat, and sometimes he felt faint. But the images themselves made this discomfort inconsequential – here was time stolen, wafered, and pressed onto silvered copper; here were nature’s blueprints, transcripts of light, from the finial of a flagpole to the tweed edge of a man’s jacket, all of it replicated in nuance, shadow and substance. Daguerre’s sense of bodily degeneration is leavened with hope. He knew the process would carry his name – D-A-G-U-E-R-R-E-O-T-Y-P-E – and he knows the scientific value of his discovery. Fame is his: he presents his findings to the Academie des Sciences and receives a standing ovation. Within a year his method is in use around the world and he is feted by luminaries such as Edgar Allan Poe and Walt Whitman. (p171). But as his health deteriorates and the political situation in France explodes into riots his need to find Isobel becomes more urgent. Like Louis de Bernieres in Captain Corelli’s Mandolin, Smith eschews the trite happy ending but there is a satisfying conclusion nonetheless. A most enjoyable book for holiday reading. Looks like I am in luck! I have a copy of this in my TBR, so will have to unearth it. I hadn’t realised the author was an Aussie. Well done! I’ll be interested to know how you came by it – did you pick it up in Australia or is it a UK edition? I actually got it from someone in the States, via BookMooch when I was a member many years ago. I ended up cancelling my membership because I was just accumulating far too many books and the whole point of me joining was to offload them! I do remember reading many positive reviews about it at the time — if I remember correctly I first heard about it on Danielle’s A Work In Progress blog (not sure if you read that one?) — and the novel intrigued me because it sounded quite similar to Gail Jones’ Sixty Lights which I had just finished/or was about to read or something. Hmm, quite different in style to Gail Jones, I would say! But similiar subject matter, no? I have a feeling mine was a slightly water damaged proof copy. It’s in storage, so I’ll have to dig it out over the weekend. I gave up being on BookMooch. It was costing me a fortune to send nice books that I listed to people all over the world, and I could never find anyone willing to send books to Australia. So then I put a note on my profile that I would only post overseas to people who would send books anywhere – which seemed fair enough to me – but there must have been a few of us doing this because BM then changed the rules so that you couldn’t place that restriction. I keep most of my books but those I don’t want any more now go to the Op Shop.